One of my earliest memories, when I was not much taller than a card table, is of helping my Grandmother and big brother put together jigsaw puzzles. They would coach me to try this piece in a particular spot, and of course, when I fiddled with it and rotated it just right, it magically fit and everyone cheered. I was soon doing them either with other family members or by myself and continued to do them as I grew up and as my own children grew up. However, I had never really known the truly wonderful hand-cut puzzles that were made in the 30's 40's and 50's. Mine were mostly the regular cardboard puzzles with knobs or holes on four sides, or the thick, squiggly-shaped TUCO's. In the late nineties, while checking the internet, I suddenly thought someone probably was selling old puzzles like the kind I had first done with my grandmother. Those had been inadvertantly left behind in a move when I was a child. Sure enough,	there were lots of TUCOs, Big Ten, Perfect Picture and more. I also started seeing wooden puzzles and even bought a few. Thus began my wooden jigsaw puzzle collection. But, being an engineer at heart, I wanted to create some of my own. In October of 1999 I bought a saw and began cutting puzzles. My first puzzle was a modest 5x7 with about 100 pieces. There were no figurals, the edges of the puzzles were as straight as I could get them, and since I hadn't really studied cutting styles, it was mostly free form. I was just happy I hadn't cut any of the knobs off or made any other typical beginner errors. By Christmas time, I was putting in figural pieces and experimenting with different cutting styles, creative edges, and all the other features the top cutters put into their puzzles. My son's Christmas present was a 500+ piece puzzle with irregular-edged, bellowing clouds at the top and a large multi-piece fire-breathing dragon figural hidden in the sky. In Spring of 2000 I joined the American Game and Puzzle Collectors Association, and displayed my puzzles at their annunal conference in May. My puzzles received critical acclaim from the puzzle enthusiasts present. I opened this site in July of 2000 and featured my first puzzle on ebay. Nine years later, there are well over 600 hand-cut Jardin Puzzles in homes and offices worldwide. At some point, (I keep telling myself) I will update the site to show more of them off. You can see some on the gallery artists pages or on Melinda's List page. You may wonder how I chose the Jardin Puzzles name. I grew up in Vermont, where the short winter days and long winter nights are great for jigsaw puzzles. It was also great for gardening in the summer. I love iris and picked a stylized iris as my signature piece. For those of you who know French, "jardin" means "garden" and continues the theme. 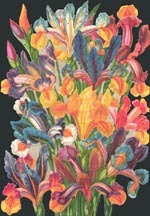 If you look in the gallery, you will find quite a few images of flowers, including a very difficult Iris puzzle. Aside from puzzles and gardening, I studied mathematics and computer science and spent most of my early career developing computer graphics software. This was really just more puzzles with pictures. By the time our two children were grown, I was managementing a large engineering department and had no time for jigsaw puzzles. The hiatus from puzzles was good, for when I retired, and went back to them, it was with renewed enthusiasm. I have been making puzzles full time for almost nine years. Now I cut either here in Massachusetts for much of the year, or up in Nova Scotia where we have a summer home. Visitors are welcome to drop by either place for a demonstration or to just talk puzzles. And wherever I am, email reaches me. I will continue to update this site with new puzzles, new artwork and maybe more history and puzzle-craft. So stay tuned and happy puzzling.